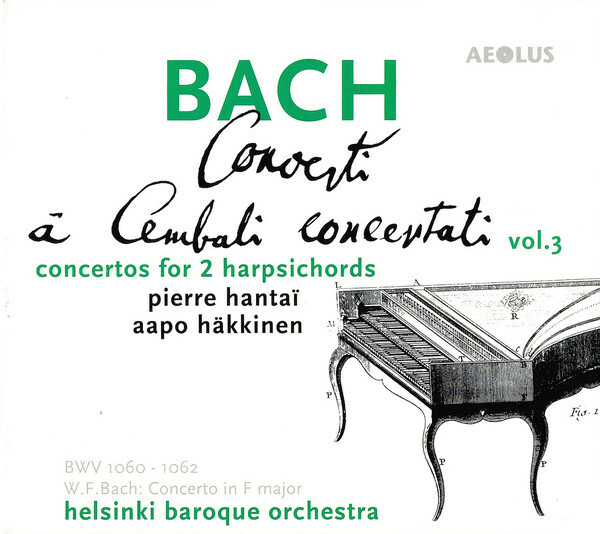 Aapo Häkkinen here completes his three-volume survey of the Bach keyboard concertos with a program dedicated to the concertos for two keyboards and orchestra. The previous volumes have garnered high praise, particularly for the clarity of execution and recording, and those virtues are again evident here. The readings are at the strict end of the period performance spectrum, but they never feel stilted, and while the standards of historical verisimilitude are high, the performances also have an engaging sense of spontaneity througout. 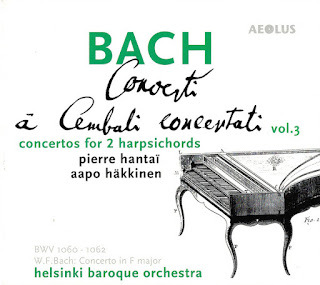 The Helsinki Baroque Orchestra seems a misnomer, given that it is here represented by only four members. The scholarly liner note, by Häkkinen himself, references Richard Maunder’s research to support the view that this was the size of the orchestra at the original Zimmermann Coffee House performances, and that no violone was added. But even so, this performance seems to make a particularly point of the chamber scale, with close miking, especially for the harpsichords, and the performers seated very closely together, as evidenced by a sessions photo in the liner. The harpsichords themselves also have impeccable credentials. Häkkinen plays a copy of a Harrass instrument, the Harrass family close collaborators with Bach in his Arnstadt years. His colleague, Pierre Hantaï, plays a copy of Zacharias Hildebrandt harpsichord, thought to be close in style to the instrument Hildebrandt built to Bach’s specification for the Zimmermann performances. 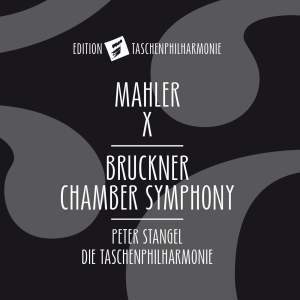 Both copies were built by Jürgen Ammer, who died in 2017 and to whom the recording is dedicated. Photographs of the instruments in the gatefold show sturdy, eight-legged, two-manual instruments, lacking only the elaborate frescoes under their lids. The recorded sound favors the keyboards over the strings, with microphones attached directly to the body of each harpsichord. The harpsichords both sound rich and resonant, with the 16-foot stop of the Harrass a particular asset in the slow movement of BWV 1062. The two soloists are well separated in the stereo mix, but the surround sound brings them closer together, still distinct but requiring greater effort by the ear to pick out their individual sonorities. The strings don’t have the same level of presence or physical depth, and have presumably been suppressed to allow the harpsichord sound to shine through. In all other respects, though, these are admirably free and flowing performances. Both soloists have a keen sense for the rubato and delay required for effective phrasing, but in most cases this is so subtle that you have to really listen to work out how it’s done. The strings are similarly vibrant, with excellent ensemble and a rich tone (despite their numbers) to support the soloists. The W. F. Bach Concerto (without orchestra) dates from the 1730s and is therefore contemporaneous with the concertos of Bach père. The interplay between the two instruments here is simpler, but benefits equally from the clarity of the audio. Häkkinen suggests that the first movement “approaches the principles of sonata form,” but the simple interplay of solo and tutti textures points to the (also contemporaneous) Italian Concerto. On first hearing, this disc can seem austere. The scale of the instrumentation, while historically justified, seems very small, a feeling exacerbated by the close miking and relatively dry sound. But the level of musicianship here is outstanding, and, while clarity of texture is a primary goal, the musical interest never flags. The most obvious comparison is with the recent recording from Masaaki and Masato Suzuki and Bach Collegium Japan (BIS 2051), also in excellent SACD sound. Tempos are similar, although the Suzukis are a little more strict. Conversely, the BIS recording is made in a concert hall setting and is more expansive. Häkkinen and co. have the upper hand in clarity, but only just. If I prefer the Suzuki overall, it is because the orchestra comes across better, the BIS engineers somehow finding a way to give the strings their full weight without obscuring the harpsichords. Also, the Suzukis add a violine into the mix—a bit naughty but it adds valuable weight to the tuttis. This review appears in Fanfare magazine issue 41:5. 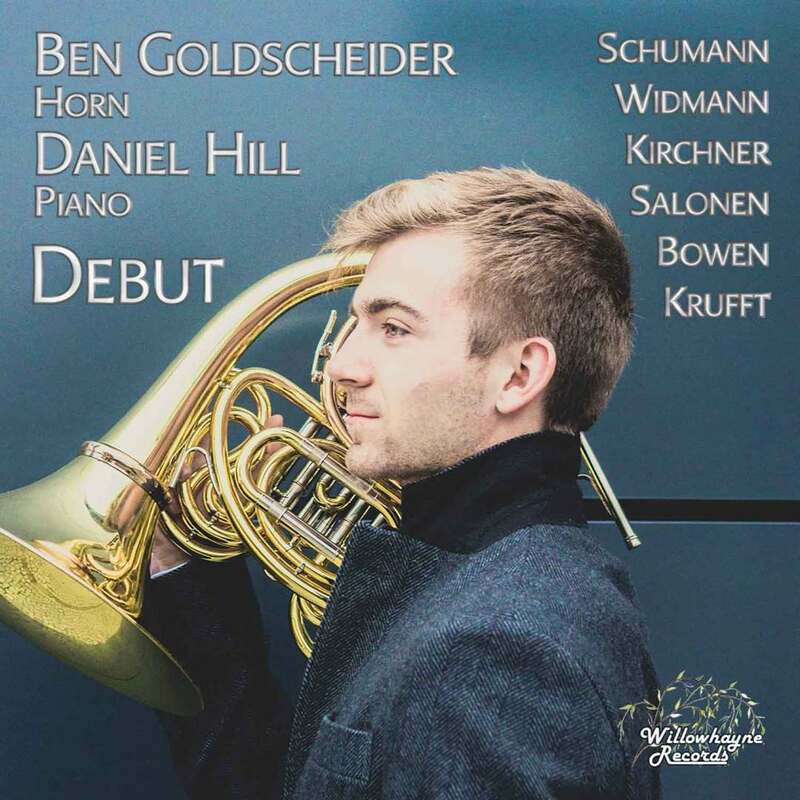 Ben Goldscheider came to national attention in the UK as a finalist in the BBC Young Musician of the Year in 2016. He is now 20, and a student at the Barenboim-Said Academy in Berlin. This, his debut album, revisits several of the works he performed during the Young Musician heats and also includes some of the core Classical and Romantic repertoire for the instrument. Goldscheider has an elegant tone and excellent agility for fast runs. But it is not a huge sound, the tone focused but slightly nasal. He gives the slightest hint of a slow vibrato in the Romantic repertoire, but otherwise maintains an even sound. Once or twice in this recital, there is a feeling of fatigue towards the end of long, complex phrases, but otherwise his technique is immaculate. The program opens with Jörg Widmann’s Air for Solo Horn. Typically for Widmann, the work involves going back to the instrument’s acoustical basics, with the music growing out of an exploration of the harmonic series, and making great play out of the flattened seventh. The fast runs up and down the harmonic series are skillfully negotiated here, as are the extended techniques, which include singing into the instrument. Following the Widmann with the Krufft Sonata is an ideal piece of programming, and the way that the Classical-era piano accompaniment emerges from the preceding sonoristic textures makes for a dramatic transition. The Krufft is core horn repertoire, although it seems to have been commandeered by hand horn players recently, at least on disc. It is not the most exciting music, although it is far preferable to the wretched Beethoven Sonata that would have been the obvious alternative. And Goldscheider demonstrates a keen affinity for the Classical style, with beautifully shaped phrases and dramatic, but proportionate dynamic shifts. Schumann and York Bowen follow, showing Goldscheider to be equally at home in the Romantic repertoire. My one grumble here is the recessed piano sound. Accompanist Daniel Hill, who also performed with Goldscheider in the Young Musician heats, is clearly avoiding the limelight throughout this recital, which is reasonable given its focus. But the piano is also recorded at a distance, or at least a low level, and the Bowen in particular suffers. The Kirchner work was originally a song cycle for horn, baritone, and piano based on Rilke, and the piano here plays an even more subsidiary role, often just as a resonator for the horn, who plays into the body with the dampers raised for echo effects. The overall impression of the work is of an austere, gestural Expressionism, and Goldscheider makes the most of its dramatic potential. The recital ends as it began, with a new work for unaccompanied horn, the Concert Étude by Esa-Pekka Salonen. Goldscheider clearly feels a close affinity with this music—he played it in two rounds of the Young Musician—and it is an excellent fit for his talents. Salonen, a former horn player himself, fits a wide range of extended techniques into the short work, and the piece is particularly effective for the Klangfarbenmelodie effects achieved by successively playing the same pitch, but at different sides of the double horn, or with different hand-stopping positions. It also has that mercurial energy that underpins all of Salonen’s music, an unpredictability that sees it shooting off in different directions in almost every phrase. A promising debut, then, and a suitably diverse programme to demonstrate what is clearly a broad and diverse talent. Detailed liner notes on the music, most by Goldscheider himself, add to the attraction, as does the generous running time. Elisaveta Blumina here continues her project to record Weinberg’s chamber music, this her second album of solo piano works, adding to a catalog that also includes the Piano Trio, Double Bass Sonata, and a disc of woodwind sonatas. 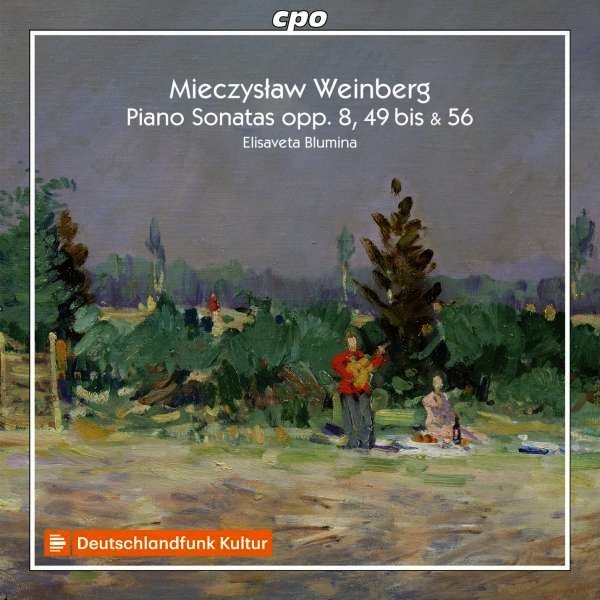 The three piano sonatas here span Weinberg’s diverse career, so there is plenty of variety. Another recording project, a complete solo piano works from Allison Brewster Franzetti on the Grand Piano label, runs to four CDs, so this constitutes about a quarter of the repertoire. The two numbered sonatas here, Nos. 2 and 4, are from a canonical six, while the op. 49bis is a reworking of earlier music into a sonata structure. The program opens with the Second Sonata, dating from 1942, a period when Weinberg was predominantly occupied with film and television music: his famous contributions to the Russian version of Winnie the Pooh date from these years. Most discussion of Weinberg’s stylistic trajectory plots his work against the increasing influence of—or mutual influence with—Shostakovich, which is certainly apparent in the Fourth Sonata. However, the Second sounds closer to Prokofiev, especially in its percussive, toccata-like first movement. The energy and drive make for a highly engaging start to the program, and Blumina finds an ideal balance between the focussed attacks and the sonority required to maintain the long lines. With the exception of the slow third movement, most of this work plays out in two-part counterpoint between the hands, and Blumina’s clarity of texture plays dividends throughout. The Adagio third movement feels a bit too long for the work’s otherwise concise proportions, but it is beautifully structured in this performance, with Weinberg’s gradual build-up to the climax carefully paced in volume and harmonic density. The Sonata, op. 49bis, is dated 1979 but is in fact a reworking of the Sonatina of 1951, itself an elaboration of music from Weinberg’s Childhood Notebooks, previously recorded by Blumina on CPO 777517. Despite having been twice expanded, the music retains an intimacy and appealing gentle character. Of its three movements, the first two are markedly more chordal than in the Second Sonata, while the fugal finale returns us to Weinberg’s contrapuntal tendencies, although his delicacy and charm remain, and, although the work fits squarely in Stalinist-era socialist realism aesthetics, there is never any pedantry or dryness, and the music’s simplicity works to its advantage throughout. The Fourth Sonata, from 1955, is more serious. The notes, by Dr. Marion Méndez, describe it as the most tragic of Weinberg’s piano compositions, reflecting the composer’s grief at losing his entire family in the Holocaust. It is certainly solemn, but the music is never morose, and Weinberg always knows when to add rays of light into his otherwise melancholy moods. Like the other sonatas, it is based on simple, elegant material, although this is soon developed into more emotionally complex areas. Yet the emotion always remains understated, especially in the second movement (of four), where occasional piquant dissonances unsettle the otherwise smooth flow of the melody, and in the finale, which has a more upbeat mood, even if that is soon undermined by the sheer lightness of the textures, at least against the more weighty music of the previous movements. Méndez tells us that Gilels recorded the work in 1960, but with much faster tempos. That recording is now available as part of Melodiya’s 50-CD Emil Gilels: 100th Anniversary Edition (1002433). Another Gilels recording (presumably), from 1957, is available on YouTube, and it is a full five minutes shorter than Blumina’s 30-minute reading here. By comparison, Gilels sounds rushed, especially in the first movement, although his tempos are supple, with plenty of restrained interludes. But Blumina’s interpretation is more convincing, not least for the directness of expression she achieves at her more measured tempos, as well as the clarity of texture and line. As in her previous Weinberg releases, the audio quality here is excellent—deriving from a co-production with Deutschlandfunk Kultur, the studio recordings made in January 2016. These aren’t the only recordings available of Weinberg’s piano sonatas, and as well as the Franzetti, there are also versions of Sonatas Nos. 2 and 4 from Murray Mclachlan on Divine Art. But, as the comparison with Gilels demonstrates, there are many ways to approach this music, and Blumina’s interpretations are convincing and compelling throughout.